← Got Happy? A super simple formula for an all-around awesome life! Posted on October 21, 2013	by Denise Banks-Grasedyck, Coach. Consultant. Speaker. Ok, imagine it’s Monday again. Are you “A” – excited to greet Magic Monday and all its possibilities and opportunities? Or would you honestly prefer “B” – whatever it may be? 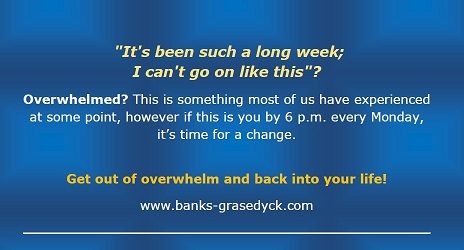 Start closing out your current week at the close of business on Thursday. If you did not do this at the beginning of the week, you will need an overview of your tasks for the week. To do this, create a paper list with two columns. On one side list everything that you would like to have completed in the current week. From the list select a maximum of three top items that must be finished by the end of next day. Repeat these items in the other column. The items in this column are your “top priority and urgent” list and the first items of business you will handle on Friday morning. Note: If you consistently have more than two items on your top priority and urgent list, examine your time management as well as your boundaries around taking on work on-demand. If you are constantly overwhelmed and continue to take on more work because you fear that your boss will be upset or disappointed in your performance, you are laying the basis for a self-fulfilling prophecy. Be realistic and clarify priorities in a conversation with your boss. Block out time in your calendar to handle your priorities first thing on Friday morning. Make a commitment to yourself and to your peace of mind, that this time is non-negotiable. On Friday, work on your top priorities during your scheduled time and until you have completed the task. If you are not able to finish in a work day, again you will need to look at your work load, your planning and delegation skills and other factors that may be influencing your ability to complete your work. You may simply be setting unrealistic goals. At the end of your work day on Friday, return to your long list of what you had hoped to complete in the current week. Check off all that you have accomplished. Everything that is not checked off gets marked with a star or highlighted with a marker. These are next week’s “opportunities and possibilities”, so write that heading across the page and place the list on a prominent place on your desk, where it will spend the weekend (not thinking about you.) Make a commitment to yourself that once the list has been laid in aside, you will no longer think about it or worry about the things not yet done. Imagine that these are opportunities waiting for the right time to be realized and this time will not be before the coming Monday. Since you are in the process of making the transition from Moan-day to Magic Monday, be creative in sparking some excitement about your “opportunities and possibilities”.Try putting the list in a large letter-sized envelope with a positive note to yourself, such as “It’s Monday! Today I make it happen!” or “I am so grateful for today’s opportunities and possibilities!” You may want to buy an expensive –looking letter sized and relatively flat box that you can place on your desk at the close of business every Friday. In addition to the list, put something in the box that makes you look forward to opening it; your favorite mints, a beautiful new pen, a specialty golf ball, a favorite photo, a short poem that inspires or motivates you or a gift certificate for a special treat that you will give yourself at the end of the day. You know what excites you – just make sure it fits in the box. Now go home and enjoy the weekend, so you can be refreshed, energized and more productive in the coming week. Whenever you find yourself thinking about what has to be at the office next week, remind yourself that those opportunities and possibilities are ripening and Monday is the perfect day to access them, learn those lessons and reap those benefits. Then bring your mind back to the here and now. Remember, just as you got into the habits that created Moan-day, you will need some time to feel comfortable with your new routine and the new habit of looking forward to the possibilities and opportunities of Magic Monday. Stick with it. You will become more productive at the office and more enjoyable to yourself and others when you are away from it. How was your Monday? I’d love to know, so leave a comment. Know someone who could use a little more magic in their Mondays? This entry was posted in Burnout Prevention, Insights, Success Tips, Work, Life and Balance and tagged Monday blues, overwhelmed, productivity habits; Magic Monday. Bookmark the permalink. I try to keep Monday as a quieter business day. Planning, dreaming, sorting, writing, working on peaceful projects, that way by the time Tuesday has rolled around, I am up and ready to roll for three days of client-based conversations and creativity. Then- Friday rolls around again and it is Fiction Friday! So believe me, I am motivated to get projects done by end of Thurs so I have a clear head to jump on board the plane of imagination with Deb Dorchak! Wendi, thank you for sharing your strategy for creating a a high-productivity week without going into overwhelm! I love Mondays. Monday has all the freshness of New Year’s day. I take the time on Sunday afternoon or evening to look at what’s coming up for the week and start mentally planning my course of action. I take Monday slow and ease into the work week. Sounds like a great way to get a low stress start into a productive week. Thanks, Deborah. Thank you for sharing your #1 overwhelm strategy, Jennifer. Whether we use paper, an electronic file or whiteboard, it really is helpful to get things written down and out of the space in our heads, so there is actually room for our genius to unfold! Thank you, Angela. I appreciate that you’ve shared your strategy. While there are some things that have been proven to work better for many people, there is no single strategy that is best for every person. By sharing best case examples, it helps people analyze what they are doing and perhaps what might be helpful and more effective. Yes, yes and yes!! Love this simple action plan listed out. Everything in our culture is about multi-tasking and doing more and that alone creates so much overwhelm that much less gets done in twice the time. Focusing my time and energy as you have laid out is so helpful and empowering! Closing out the weekend on Thursday is Brilliant! It is Friday morning so I am going to pretend it is Thursday and work it right now. Thanks! Thanks for your comment, Patrice! Go lady, and here’s to a great weekend! My Friday was fantastic after implementing this idea. I am looking forward to this Thursday so I do it the way you intended. Nice work! I just love the strategy of completing the high priority tasks on Friday morning, wrapping things up in order to let go of everything for the weekend!! Also, setting yourself up for success by preparing an beautiful envelope to open on Monday morning; I am going to prepare that right away! Thanks so much Denise! Gabrielle, thanks for taking a moment to comment. I would love to know what kind of special gift or little treat would have you excited to open that envelope on Monday. Wishing you a a weekend full of small wonders! Lynette, thank you for taking the time to comment and share your experience! Putting the needs of others first before taking care of ourselves is a common challenge especially for women and not surprisingly for women leaders. Not only do women leaders often follow nurturing tendencies, we additionally take on things that could be delegated to allow us to concentrate on our core competencies and stay in our genius zone which is where we are most powerful and empowering to those around us. Awareness is the first step to moving forward! Denise, what great ideas. I seldom feel overwhelm but, when I do, I will try your strategies. Really great strategizing . . . Thank for commenting, Jill! It is great to hear that you seldom feel overwhelmed. Since there is no one “perfect” way to deal with overwhelm, feel free to share some of your strategies as well.